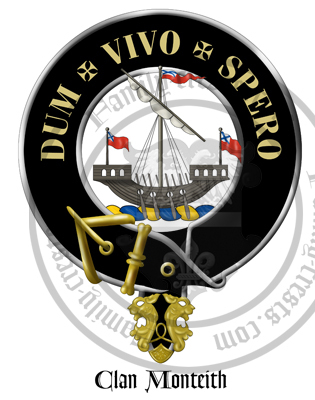 Clan Monteith of Perthshire, Scotland; the clan held lands in Perthshire since the 12th century, and the first member recorded was Malcolm de Maneteath, who witnessed a charter of 1237. Kilinus de Mineteth was vicar of Kaledrach in the diocese of Dunblane in 1322. William Mynteith and Patrick Mynteith were both burgesses of Glasgow at the beginning of the seventeenth century. Arms: Quarterly, 1st and 4th, or, a bend chequy sable and argent; 2nd and 3rd, Azure, three buckles or.